A lady demonstrates calligraphy at Sanmon, one of the gates of the temple. of the 17th century. The view of Kyoto from the second floor is superb. the stones in white sand show a mother tiger with her cubs crossing a river. only with rocks and sand. 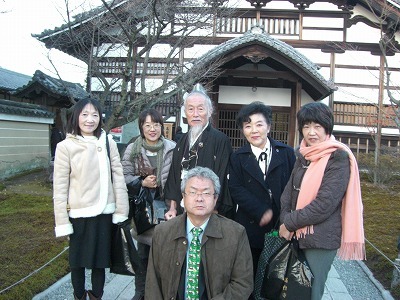 that are designated as an important cultural property. 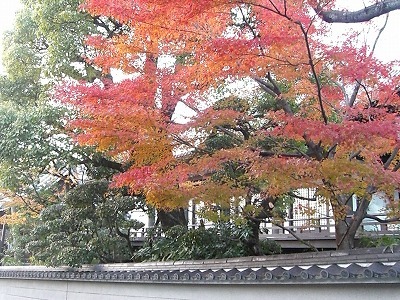 There are many sub-temples called “Tacchu” in the grounds of Kennin-ji Temple. 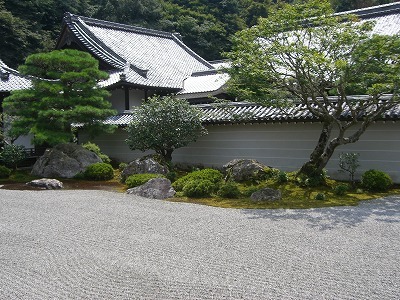 This is one of them, Ryosoku-in. 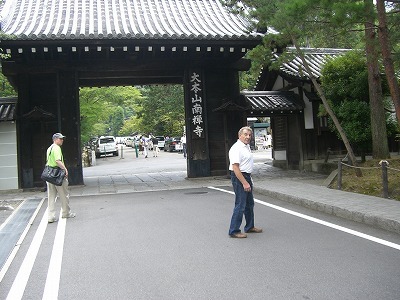 This is the gate to Ryosoku-in. telling about the introduction of tea into Japan. 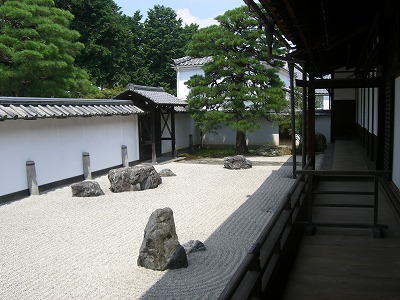 Hatto, built in 1765, is located in the center of the temple. It is also called Nenge-do. 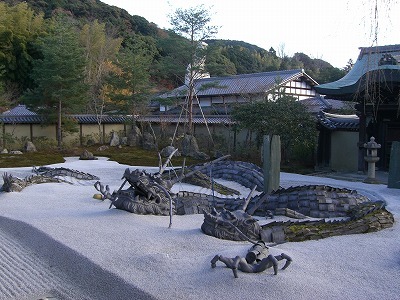 Soryu, dragons, are painted on the ceiling of the Hatto. They had a very good time. Cultural Property, is roofed with cypress bark. Ms. Matsuno Patrick has found a stone on which her father’s name had been engraved. 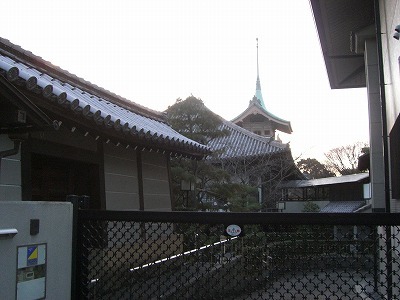 This is a view of the three-story pagoda seen from the foot of it. This is also an Important Cultural Asset. 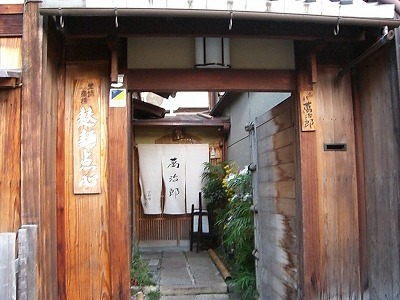 Kita-somon gate is an Important Cultural Property. Jishu-jinja Shrine is just behind the main hall of Kiyomizu. famous 13-meter tall dancing stage, which offers a sweeping view of Kyoto. 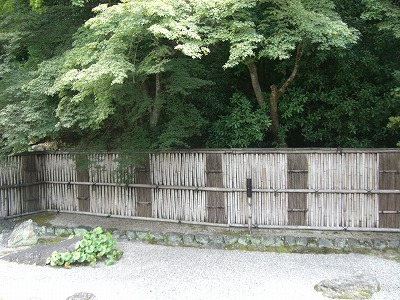 This is a view from Oku-no-in, an Important Cultural Property. 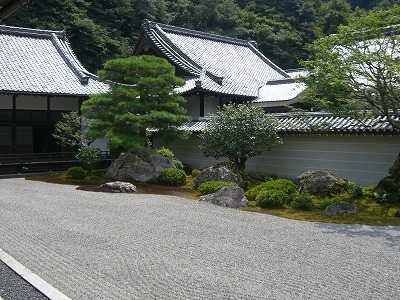 the temple precinct of Hokuzan-Rokuonji Temple in kyoto. who was the third shogun of the Muromachi Shogunate in the 14th century. started from the Bonsai planted by Yoshimitsu. 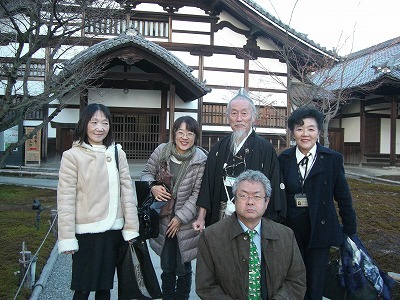 who was a grand minister of state in Kamakura period. 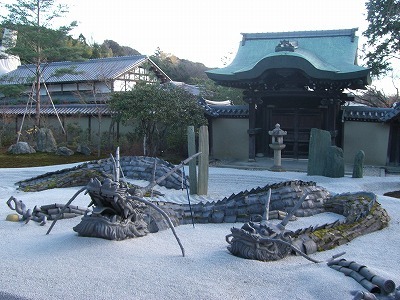 This is a tea house, Sekkatei. Nandin is used for the alcove pillar of the house. Sekkatei was built in Edo period.